Next to slinging pitches, pulling off interviews is one of the most important skills any freelancer or game journalist should strive to master in order to boost his or her writing career in the industry. Crafting thoughtful questions that engage sources and get them talking is a critical step. When putting your questions together, it helps to start by brainstorming a rough list while you conduct your initial research. Jot down anything that comes to mind as you poke around the Internet. You can always go back and word things more intentionally, so don’t worry about sloppiness: just get it on the page. Once you have a big ol’ list of possibilities ready to go, it’s time to whittle everything down into a more focused set of polished questions. It’s important to put some serious thought into both the kinds of questions you plan to ask and how to phrase them. You’ll want to design your questions to get your sources thinking (and talking). Here are a few quick tips to get you on the right track. “Oh, great and mighty plastic orb filled with blue fluid and a big floating dice thingy, I will obey your command! I am waiting for a sign!” Phffft! Avert your gaze and close your mind to such nonsense. Don’t craft questions that automatically elicit a yes or no answer. These Magic 8-Ball questions are the devil. They only give your source the opportunity to answer in one of two ways, making them far from conducive to good responses. Even if you’re not interviewing someone in person or over the phone, it’s a good idea to ease sources into the groove of tackling your questions before you whomp them over the head with a big one. Toss them a few open-ended softballs Qs that are light and laidback to get them talking. Give them a chance to feel more at ease, and then you can start to dig into the more in-depth and challenging stuff. Also, sandwich your trickier questions, if you have any, between a few lighter ones to help smooth the way. Ask the tough questions, absolutely, but don’t make it feel like a police interrogation. Try spending the first few minutes of the interview talking about non-interview stuff. Small talk like, “How about this crazy weather?” or “So how’s your convention weekend going so far?” can get you chatting in a lighthearted way that shows sources that, yes, you are indeed a normal person and not just a story-gathering press droid. You’re not a robot. At least I’m assuming so. Your sources aren’t robots, either – though I admit, interviewing droids could be pretty cool. As such, write your questions in a more conversational tone that naturally leads into the actual question you’re asking. Try to relate to your source or the subject you’re talking about rather than just hurling straight-up questions at him or her. In direct interviews, feel free to improvise your delivery on the fly to play off of earlier parts of the conversation. Interviewers are often eager to get right to the good stuff, but tackling the basics with a touch of finesse can yield some great material too. Be inventive about how you ask the duller “covering your bases” questions on your list. Instead of a simple “What do you do?” question, why not ask something more like, “Tell me a bit more about your role at [organization X] and what you like most about what you do?” Get your sources talking about themselves and give them room to go off on interesting tangents to see where they lead you. Random asides and tangents are expected and often welcome in interviews, but it’s a good idea to organize your questions in a way that flows naturally. Transitioning gracefully from one question or topic to the next will yield better results from your interviewees. Think of your questions as a set list at a rock concert, and be thoughtful about how you order them. Don’t play too many slow jams in a row. You might take different approaches for different kinds of interviews, but it’s always smart to have a loose battle plan to follow. Pad the front-end of your interview with easier questions, like “Where did the inspiration for Naked Skydiving Flamethrower Fight come from?” before digging into something deeper like, “How did your team pull off the motion capture for such an unusual concept like this?” This gives your sources time to warm up first. It’s always better to be over-prepared than stuck scrambling in the middle of a chat. Make sure you come up with enough questions to fill the space or time you’ve allotted for the interview. Also, make some of your questions two-parters to extend the length of an interviewee’s response. You might find that an interviewee answers multiple questions in one sweeping blow, so have potential follow-ups ready to go in case they’re needed in a pinch. There’s a time and a place to be ballsy. Not every interview requires rolling out the heavy artillery, but don’t be afraid to ask the tough questions that come to mind. In the gaming industry, you’ll sometimes get stuck interviewing PR representatives or public figures that are well-versed in spewing canned phrases and sanitized non-answers. Pressing your interviewees a bit harder when necessary can help you cut through the useless B.S. and get a straight answer. Note: this tact doesn’t work so well with game developers and creative folks. Posing challenging questions that can be tough to answer is OK, but playing hardball is likely to shut these types of sources down in a hot minute. Either way, don’t be a jerk with how you phrase and deliver your questions when you do pull out something a bit trickier. Here’s a quick look at how you might press a source to respond to something with a bit more depth beyond the shiny, happy PR-shtick. Dig this article? It’s actually a short excerpt from my NEW BOOK! 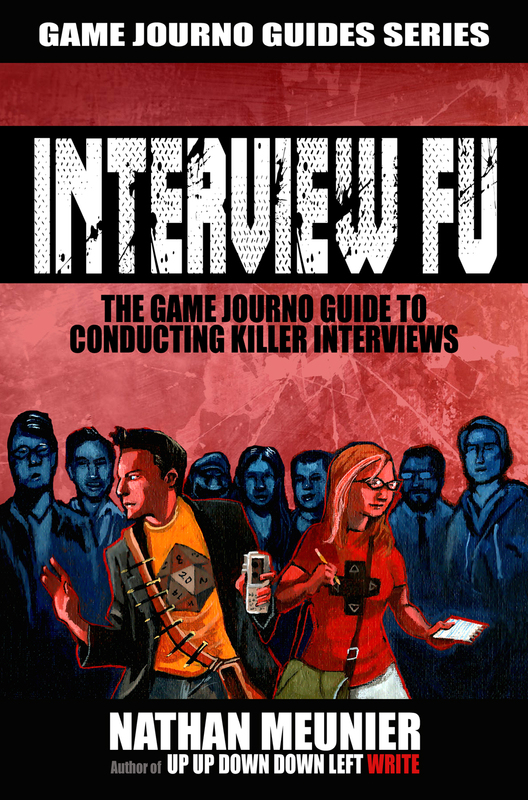 My latest book in the Game Journo guides Series, Interview Fu: The Game Journo Guide To Conducting Killer Interviews, is out now! The follow-up to UUDDLW, this shorter but info-packed guide will give you the skills you need to master the art of the interview while helping you build your confidence along the way! It features tons of tips and insights from my decade of experience conducting hundreds of interviews – both as a newspaper reporter and a freelance game journalist. It also features guest interviews from well-established writing pros like Dan Amrich and Kat Bailey along with insights from game developers themselves on how to better engage your sources! If you’re looking to take your journalism skills to the next level, you can’t do without the information in this book. This entry was posted in Freelance Game Journo Shop Talk, Shop Talk and tagged advice, books, freelance, game journalism, grammar guides, grammarly, how to improve you grammar, nathan meunier, pitching, shop talk, writing by nmeunier. Bookmark the permalink.